This picture (left), acquired by the Mars Global Surveyor (MGS) Mars Orbiter Camera (MOC) in May 2000 shows numerous examples of martian gullies that all start--or head--in a specific layer roughly a hundred meters beneath the surface of Mars. 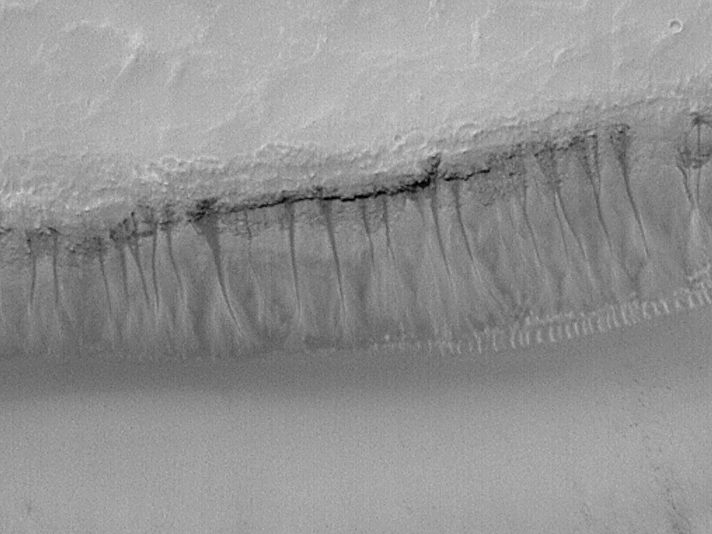 These features are located on the south-facing wall of a trough in the Gorgonum Chaos region, an area found to have many examples of gullies proposed to have formed by seepage and runoff of liquid water in recent martian times. The layer from which the gullies emanate has recessed backward to form an overhang beneath a harder layer of rock. 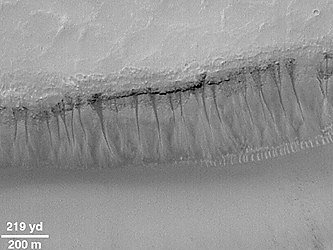 The larger gullies have formed an alcove--an area above the overhang from which debris has collapsed to leave a dark-toned scar. Below the layer of seepage is found a dark, narrow channel that runs down the slope to an apron of debris. The small, bright, parallel features at the base of the cliff at the center-right of the picture is a series of large windblown ripples. Although the dark tone of the alcoves and channels in this image is not likely to be the result of wet ground (the contrast in this image has been enhanced), it does suggest that water has seeped out of the ground and moved down the slope quite recently. Sharp contrasts between dark and light areas are hard to maintain on Mars for very long periods of time because dust tends to coat surfaces and reduce brightness differences. To keep dust from settling on a surface, it has to have undergone some process of erosion (wind, landslides, water runoff) relatively recently. There is no way to know how recent this activity was, but educated guesses center between a few to tens of years, and it is entirely possible that the area shown in this image has water seeping out of the ground today. 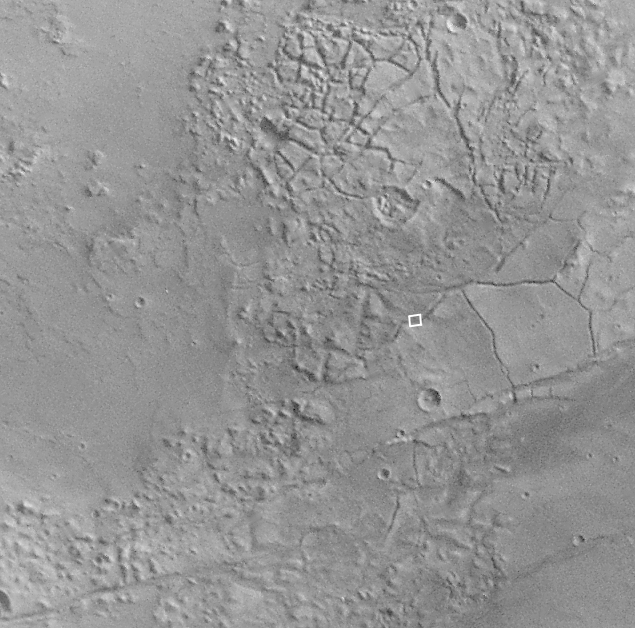 Centered near 37.9°S, 170.2°W, sunlight illuminates the MOC image from the upper left, north is toward the upper right. 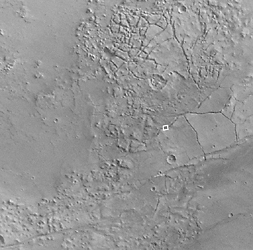 The context view (right) is from the Viking 1 orbiter and was acquired in 1977. The Viking picture is illuminated from the upper right; north is up. The small white box in the context frame shows the location of the high resolution MOC view.